Commissioning of Russian nuclear subs in the Indian Navy will generate a huge spinoff for both India and Russia. Russia and India – either through design or happenstance – are set to engage the western navies in an interesting game of undersea hide and seek. Chasing nuclear submarines is how major navies earn their keep. The Russian and US fleets track each other’s subs on a 24/7 basis by listening to the acoustic signatures – a combination of noise emissions – that are unique to each type of submarine. For several decades the Americans held the advantage as they claimed to have quieter submarines. The Russians closed the gap by the mid-1980s and today their submarines have got the inside track on the US Navy. The net result is this undersea contest has become more intense now and the stakes are a lot higher too. Unlike surface ships and aircraft, submarines do not have markings or IFF (Identify Friend/Foe) codes that can out them. The only way to identify a sub is through its acoustics. This aspect works to the advantage of Russia and India if both have the same class of submarines. The signature of an Indian Navy Akula is indistinguishable from the acoustics of a similar submarine with the Russian Navy, making it difficult or perhaps impossible for the Americans to tell one from the other. As more Russian nuclear submarines join the Indian Navy’s undersea fleet, it just adds to the complexity of tracking Russian submarines. The US Navy will have to divert more time, effort, vessels, aircraft and personnel to this increasingly complex job. The US Navy does not just track the Russian fleets but Indian Navy vessels too. According to a report by the Indian Military Review (February 2014), the American P3 Orion aircraft operating in the Indian Ocean are known to generate data on both Russian and Indian submarines. Since secrecy is paramount for the survival of submarines – which usually lack self-defence weapons – India cannot risk any country knowing the whereabouts of its second strike element. Hoping the US will not pass on information about the location of Indian submarines to Pakistan or China is not only bad policy but potentially suicidal as well. The wiser option is to achieve submarine synergies between the Russian and Indian navies and blindside anyone who is tracking their fleets. Reports that New Delhi is in talks with Moscow to lease a second nuclear submarine for 10 years suggests this undersea synergy could be a reality in the coming years. The latest submarine likely to be handed over to the Indian Navy will be the K-322 Kashalot, which Russia’s Pacific Fleet had kept in reserve. 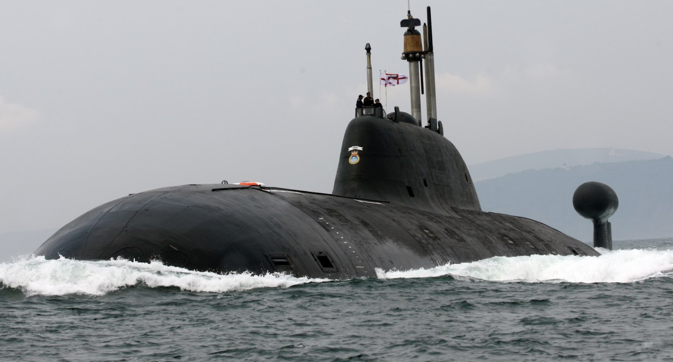 This is the third time India is leasing a nuclear-powered attack submarine from Russia. The Kashalot belongs to the same Akula II class as the INS Chakra II which is currently on a 10-year lease to the Indian Navy. The 8140 ton vessel has a submerged speed of 30 knots, has achieved a dive of a phenomenal 620 metres and is equipped with eight torpedo tubes. It has an endurance of 100 days with a crew of 73. According to the RusNavy.com, the submarine achieved a Russian Navy record in 1991 by trailing foreign submarines for over 14 days without interruption. No wonder the Indian Navy loves the Akula. “The Akula was built for one reason and one reason only: To kill US Navy ballistic missile submarines and their crews,” a US official told the Beacon. “It’s a very stealthy boat so it can sneak around and avoid detection and hope to get past any protective screen a boomer might have in place,” the official said, referring to the US Navy nickname for strategic missile submarines. That pretty much sums up why the Akula was a big scare word among western navies during the 1980s. After a brief absence during the 1990s, when the Russian Navy shrank faster than a deflated balloon, these upgraded attack submarines are back, prowling the oceans. If the Akula was a scareword, then the Yasen is a frightful nightmare for its opponents. The cruise-missile carrying boat was designed to target US aircraft carrier strike groups. Considering that India is a former victim of American gunboat diplomacy, the Yasen should be the perfect solution for scuttling any foreign adventurism in the Indian Ocean. The 13,800 ton (more than double the size of the INS Arihant), 390 feet long submarine has a maximum “silent” speed of about 20 knots and a maximum speed of up to 40 knots. The sea endurance of these boats is limited only by food supplies. The Yasen and similar new generation submarines have allowed the Russians to run rings around the Americans in recent years, demonstrating a quantum leap in technology and high levels of seamanship.